Last month was Project AWARE’s Debris Awareness Month and being a conservation-minded company, Downbelow didn’t hesitate to support the project by embarking on a daily beach cleanup held every morning before work. Actually cleaning the beach surrounding our dive centre is not something new to us as our trainees do it every day of the year. This time however we went all-out as the whole island crew joined the cleaning crew and collected debris on the shoreline to show support and at the same time raise awareness about the debris problem that is facing the environment. 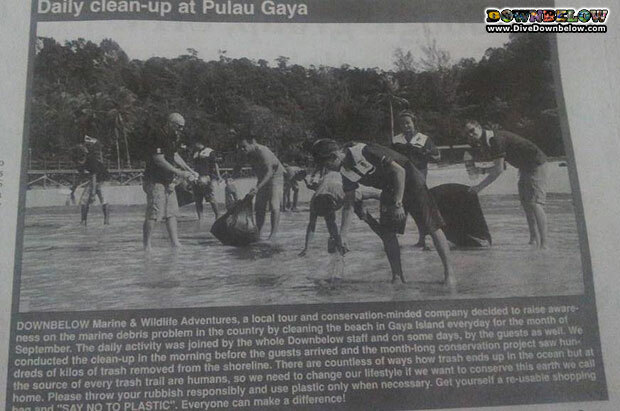 We couldn’t be happier that our hard work was highlighted in Sabah’s most circulated English newspaper last Friday and we hope it raises awareness among the general population and also make some people ask questions over their own efforts with regards to rubbish disposal. What about you? Do you practice good conservation habits? If no, maybe it’s time to think about how you might contribute to protecting the environment.